This post is part of "Building sample middleware"
The data structures are very important in middleware world. Because we often connect multiple systems we need to define an “domain model” for integration. The domain model means that objects we share between all systems are well known, well defined, well understand in multiple teams often provided by multiple vendors. Let see what does it means in practice. If you talk with business guys you have to use same terms with programmers. You might be mediator but not the translator. As integration team member mediate correct shape of solution but don’t became a translator between business divisions and developers (unless you are business analitic). All people should use same terms to minimalise problems with number of definitions. That’s first step of multiple projects, not only integration. If you look for deeper knowledge of domain definitions check a “Domain Driven Design” book written by Eric Evans and published in 2003. Ok, maybe business is not always part of integration project, but you communicate systems used by people, isn’t? You have names and scopes for your classes and objects. Probably you have 90% of fields that will be defined in them. Remember to don’t put too much informations from one system to domain model. Domain model is not list of entities from one system. Make sure that you don’t share database identifier from one system to second. Identifier should be business, for example most of clients might be identified by personal document, most of companies can be identified by tax id, not by database sequence. For future reasons try to extract atomic values, like for databases. With atomic values you will have less text processing to extract specific data and less code to maintain. That’s case for distributed teams. Usually every team have own parts of software to do and every team plays different game. Someone else produces messages, someone consumes them, this is place when you’ll have small wars. Make sure that data structures you all have to share match common needs, that defined identifiers are fine for different systems too. I met multiple situations when system analytics from two companies spent lots of hours on phone defining field constraints. Don’t follow this path. There is number of different wire formats not listed here – for example Protobuf, EDI which match this scenario too. I don’t count them (even if I should) because first is not well supported in many languages, second is rather legacy format not well for new systems. Every transaction will have unique identifier generated by UUID. Transaction will point to some Client and have assigned Money object. In our case client is very simple POJO which contains fields ID and name. For middleware purposes we going to use only ID. Name might be usefull for user interface operations. 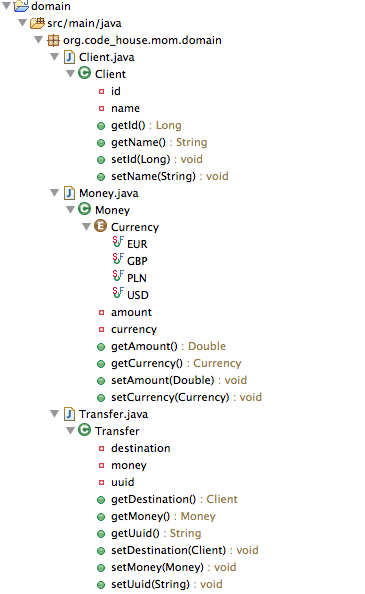 Because we going to transfer some money to client account from producer we have to use proper data structure for a “cash”. Few years ago Martin Fowler in his book “Patterns of Enterprise Application Architecture” defined a Money pattern which is suitable to handle money values. We have to remember that client account might be handled in different currency and we cannot send only amount information. We need a currency too. That’s all for data structures. It was more about philosophy than about code, but don’t worry – in next part we going to write more. All needed classes you’ll find in git repository. You may download zip archive|tar archive if you don’t have git client.